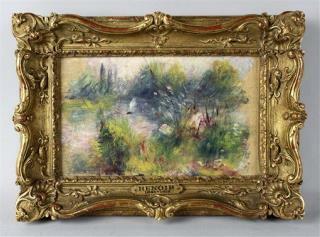 (Newser) – The case of the Renoir supposedly purchased at a flea market for $7 in 2009 continues to unspool dramatically: Now the Washington Post finds three witnesses who say On the Shore of the Seine hung in Marcia Fouquet's Virginia home in the 1980s and 1990s. That would seem to dispute the story Fouquet's daughter, Martha (or Marcia, depending on which article you're reading) Fuqua, has given about her lucky find. The painting was discovered to have been stolen from a Baltimore museum in 1951, and now Fuqua is fighting to hold onto it. Robert Musser, who dated and lived with Fouquet in the 1980s, recalls the small, ornately-framed painting adorned with Renoir's name on a small plaque attached to the frame. "She said it came from a museum in Baltimore," he says. "She said it was a real Renoir, that she owned a Renoir. ... She never told me how she acquired it." He assumed it was a fake. An anonymous childhood friend of Fuqua's says the mother and daughter showed her the painting in Fouquet's studio in the 1990s and said it was a real Renoir. "I didn't ask where it came from because I just assumed they were lying," she says, but the "unusual" frame and Renoir plaque stuck in her memory. Bobby J. Fontaine, a former student of Fouquet's who lived with the family for a time, also remembered Fouquet showing him the painting in the 1990s. "She says, 'Do you think it’s real or not?'" he recalls. "I told her, 'I guess it’s real.'" But they spoke no more about it. Doors were invented to let people in and out, and as long as doors were included in the design of safes, vaults and houses, they would continue to serve this purpose. I think Ms. Fouquet understands that principle very, very well.